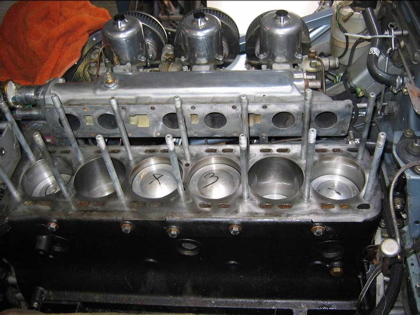 OK, here is part two of my engine rebuild story. You can read part 1 here. 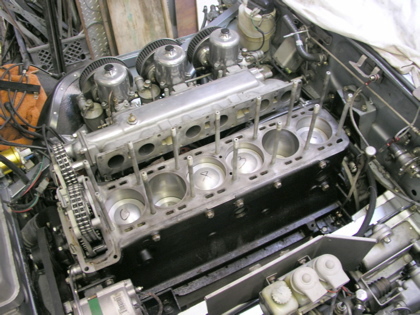 I went up to Chilliwack yesterday (June 23) to check on status, since the head has just returned from the machine shop. A couple of weeks ago we decided to bite the bullet/wallet and completely rebuild the head. It was just so fundamentally botched that it was beyond the point of getting it right without a total rebuild. Like every other layer that we peeled back so far, more horrors were revealed as the head was disassembled. 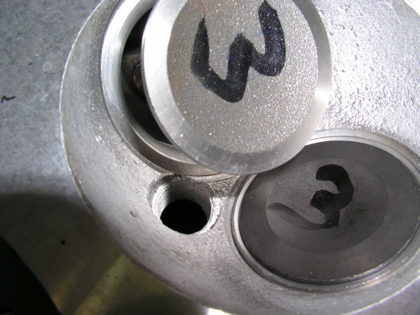 Valves cut. 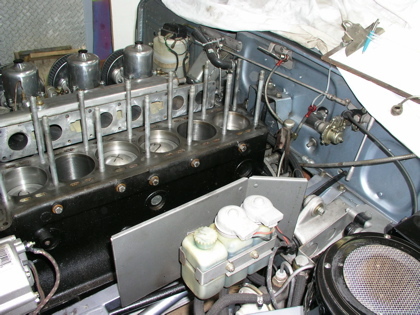 Under-spec shims & tappets. Improper washers. 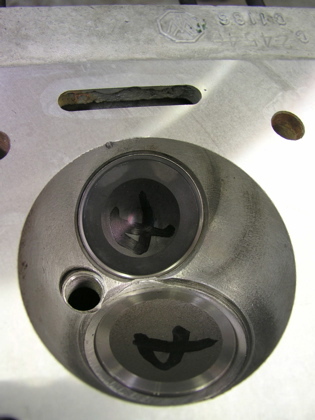 Valve seats almost gone. 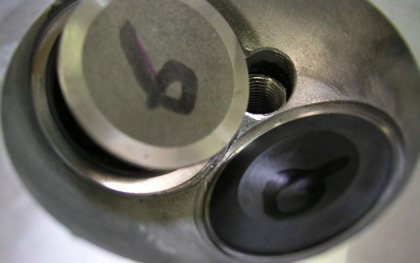 The bottom was not machined flat, but had a .002" concave furrow running longitudinally down the middle. 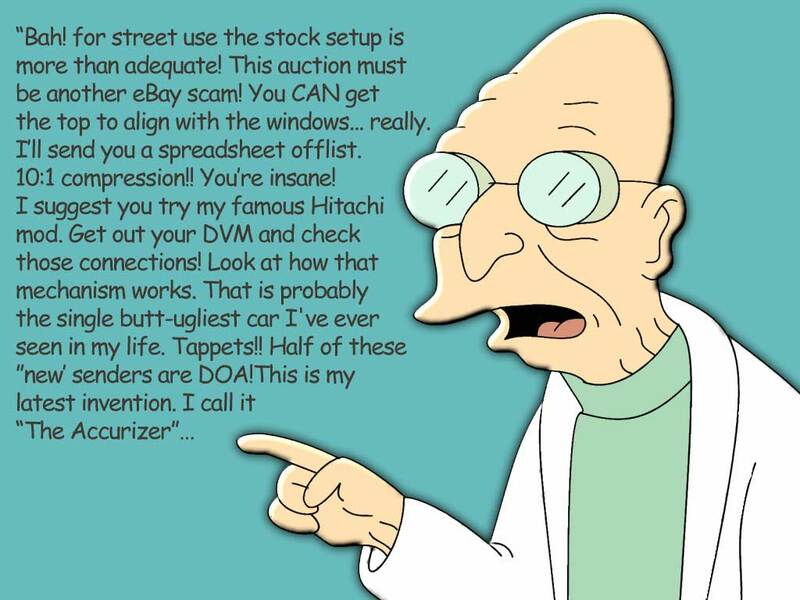 NOT what you would expect for an engine rebuilt less than 10,000 miles ago by a supposedly world-renown shop. 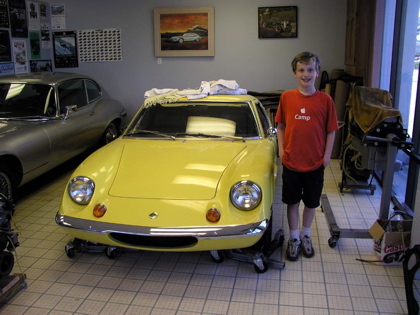 If you are considering having Classic Jaguar of Austin, Texas work on your E-type, or any car for that matter, have a close look at their work here. All the bad bits have been yanked out and thrown in a box. The bottom ground perfectly flat - along every axis. YES Ray, as little metal removed as possible to get it flat again; and we *will* compression test once back together! 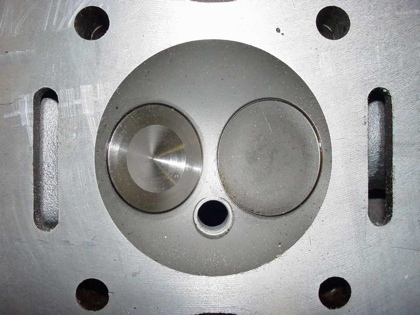 Ray Livingston sent me this photo to show me what my head/valves *should* look like. 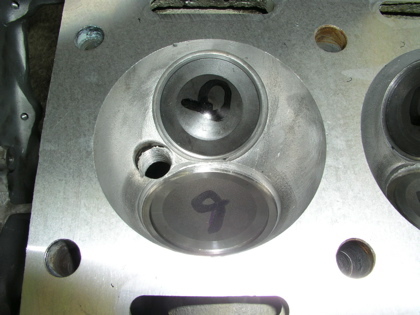 After some time in the machine shop, here is my head/valves. 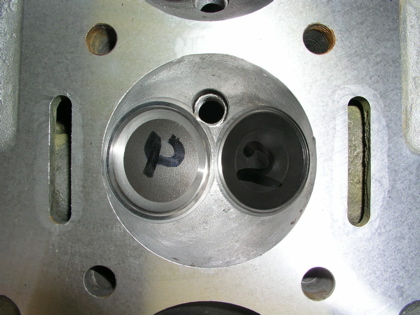 New Valve seats have them flush with the combustion chambers again. Here is a shot that shows the new seats well. 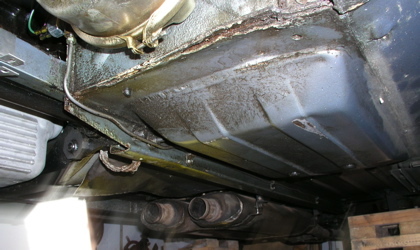 Here is a shot of the odd split in the tub, in the driver's side footwell. I noticed it before, but did not realize that it extended all the way through. Geoff illustrated this by sliding a screwdriver through the hole. 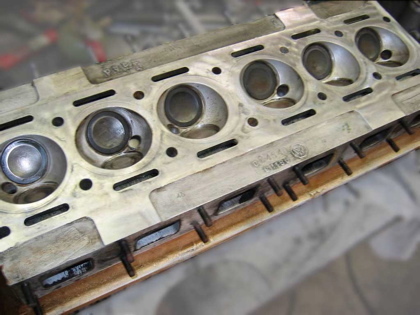 The block, awaiting the head. 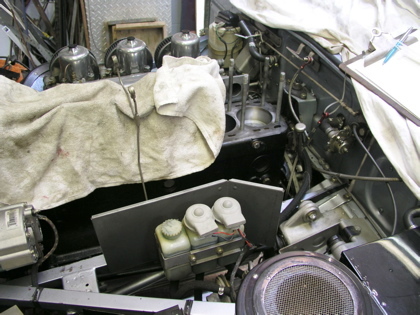 Note the stock oil feed pipe on the towel. We are considering replacing the braided one with this stock solid one. Uncovered. Note the dust caps on my brake fluid bottles. Geoff installed those for me. 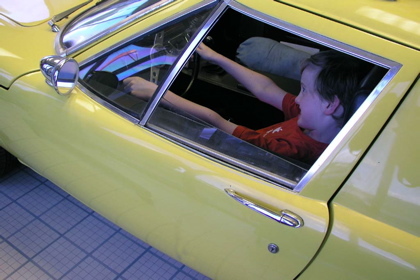 Nicholas was getting a lesson in how an internal combustion engine works. 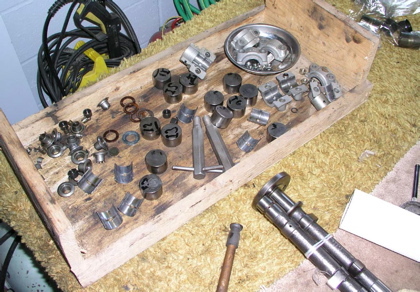 Up until today, he had only seen the internals of a Briggs & Stratton lawn mower (flathead) engine. This was his introduction to four-stroke Hemi-head, tri-power. I think he likes it. All the bodged bits in a box. The cams had JB Weld in the ends, instead of a brass plug(!) Not that I am disparaging JB Weld, but it isn't what you would expect from a high-dollar resto! One cam bearing is badly worn too. ...at least "correctly scaled" compared to a big guy like me. 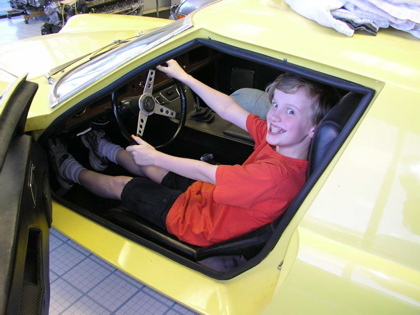 =) Think Nick is ready for his license? See what I mean about scale?